The UN has refused to respond to allegations that it is responsible for the cholera epidemic in Haiti, citing diplomatic immunity. NBC's Dr. Nancy Snyderman reports. Survivors and family members of nearly 700,000 Haitians who have contracted cholera are suing the United Nations for billions of dollars, accusing the U.N. of covering up its role in starting the worst outbreak of the deadly disease in modern history. The suit will be filed in Manhattan federal court on Wednesday despite the U.N.’s longstanding immunity to all legal claims of wrongdoing. The U.N. has cited its immunity, and has not accepted responsibility for the epidemic, even though medical experts – including members of an independent panel appointed by the U.N. -- agree that the disease was probably introduced by U.N. peacekeepers. During an interview in Port-au-Prince Monday, a top U.N. official repeatedly refused to answer questions from NBC News’ Chief Medical Editor Dr. Nancy Snyderman about whether the U.N. was to blame. Lisette Paul, 41, said that the worst part of losing her 18-month old daughter Jumara to cholera was having to bury her in a hole. Her daughter got sick in the first outbreak of cholera in late 2010, and her brother and father also died. Lisette got the disease in 2012, but survived. “I think what’s important is to see what we’ve been doing since the outbreak,” she added. Since the cholera outbreak began near Mirebalais, Haiti in late 2010, just ten months after a devastating earthquake, more than 650,000 Haitians have contracted the disease, which had been unknown in the country for centuries. It has now spread to Venezuela, Cuba and the Dominican Republic, and has now killed more than 8,500 people. Numerous scientific studies have linked the disease to a group of U.N. peacekeepers from Nepal who arrived at a camp near Mirebalais in October 2010. Tests show that the strain of cholera circulating in Haiti is genetically similar to cholera found in Nepal. Members of an independent panel appointed by the U.N. initially said that the evidence pointing to the peacekeepers was not conclusive, but have since said that new evidence indicates the soldiers were the likely source. 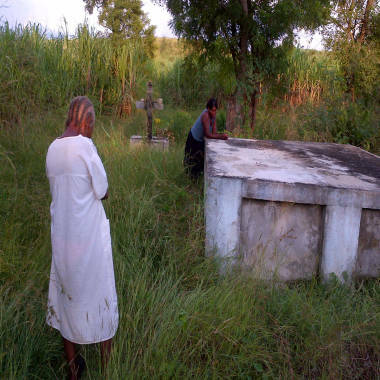 Lisette Paul (leaning on crypt) and her mother Dieumene Bastien say that some family members who died of cholera were put in plastic bags and buried in holes in the ground because people were afraid of contracting the disease during a proper burial. One cholera victim, Dieumene's son – Lisette's brother – is buried in the crypt. The Institute for Justice and Democracy in Haiti, the advocacy group that will file the suit Wednesday, first tried to file a claim with the U.N. in 2011. The United Nations did not respond for more than 15 months, but then invoked a sweeping immunity from nearly all legal claims that dates back to its founding. Though the U.N. has committed hundreds of millions of dollars to fight the disease, it has not indicated a willingness to settle individual claims from victims. The IJDH suit, however, goes beyond placing blame on the U.N., accusing the international body of covering up its role in introducing the disease. 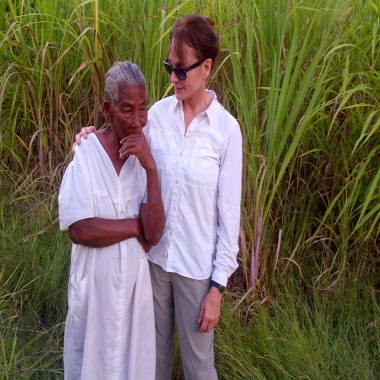 Dr. Nancy Snyderman of NBC News with Dieumene Bastien in Haiti. A group of Nepalese peacekeepers were rotated into an existing camp a mile south of Mirebalais, Haiti, on a tributary of the Artibonite River in October 2010. The Artibonite is a major source of drinking water for Haitians. Within five days, a Haitian living downstream had died of cholera. Within a month, the disease had reached every corner of the country. Plaintiff Lisette Paul of Mirebalais said that the disease spread quickly. “When the cholera first came we didn't have access to hospitals so everyone passed it on to one another,” she recalled. 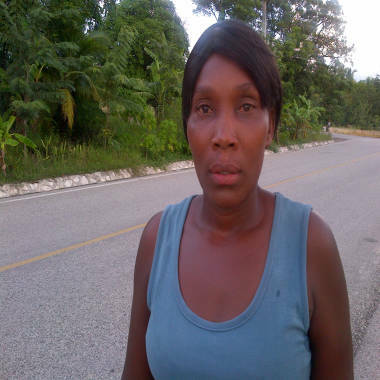 Felicia Paule, 45, lost a daughter, brother and nephew to cholera. Suspicion about the source of the disease soon centered on the peacekeepers. Cholera is endemic in Nepal, and there was an ongoing outbreak in the Himalayan country. Reporters who visited the peacekeepers’ camp noted a strong smell of sewage and saw exposed and leaking sewage pipes over a drainage canal and brown sludge in a drain leading into the river. The plaintiffs, however, say it is a “question of law and fact” whether “defendants illegally sought to cover up their actions." The suit alleges that U.N. officials falsely claimed that peacekeepers had been tested for cholera and none had come back positive, and barred Haitian health officials from the camp in late October. The suit also alleges that the U.N. issued a false statement that its septic tanks were up to U.S. EPA standards, and that an official told a reporter that a pipe carrying sewage was carrying only kitchen waste. In its suit, the IJDH is asking for an unspecified amount for victims, and for the U.N. to make improvements to Haiti’s water and sanitation infrastructure that are projected to cost $2.4 billion. The IJDH’s Concannon acknowledged that no one had ever successfully sued the U.N. in court, but said he was hopeful about the outcome. “In terms of actually winning a judgment in a court, there has never been a case against the U.N. where the liability is so clear and the damage is so great,” he said. He also noted that some parties with grievances against the U.N. had received satisfaction despite the body’s legal immunity. In 1965, for example, UN peacekeepers in the Congo were accused of damaging properties and injuring people. They submitted claims to the UN, and the UN settled some of the claims. In a statement, a spokesperson for U.N. Secretary General Ban Ki-Moon, who is named as a defendant in the IJDH suit, told NBC News that it could not comment because “it is not the United Nations’ practice to discuss in public claims filed against the Organization." The spokesperson said the U.N. is working “on the ground” in Haiti to “do all that the Organization can do to help the people of Haiti overcome the cholera epidemic.” The U.N. has spent $118 million to date to respond to the outbreak, and plans to spend millions more, depending on the level of international contributions. A representative of MINUSTAH, the U.N’s mission in Haiti, which is also named as a defendant, referred questions to the U.N.’s legal office in New York. Edmond Mulet, who headed MINUSTAH at the start of the outbreak and is also named as a defendant, did not respond to requests for comment. Why can't anyone sue the UN?